Review by AllTheBestFights.com: 2017-09-08, some good exchanges between Juan Reveco and Komgrich Nantapech but it is not enough to get three stars: it gets two. The former world champion in two different weight classes Juan Carlos Reveco entered this fight with a pro boxing record of 38-3-0 (19 knockouts) and he is ranked as the No.4 flyweight in the world. ‘Coton’ Reveco lost to Kazuto Ioka in 2015 (=Reveco vs Ioka) but then he has beat Diego Luis Pichardo Liriano and Jesus Vargas. His opponent, Komgrich Nantapech (also known as Eaktwan BTU Ruaviking), has a record of 22-4-0 (15 knockouts) and he entered as the No.8 in the same weight class but he comes off the loss against #1 Ibf champion Donnie Nietes (=Nietes vs Nantapech). 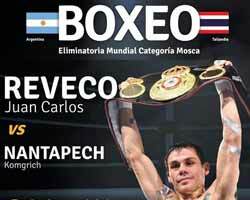 Juan Carlos Reveco vs Komgrich Nantapech is the main event of the evening. Watch the video and rate this fight!